Hi everyone! I’m Shanna from Restoration Redoux, here for my monthly project! When I moved into my house a few years back, I didn’t have a decorating plan. I bought beige furniture because I heard Nate Berkus say that you should have neutral furniture so you wouldn’t tire of it. I couldn’t stand the stark white walls in the house. I wanted to add a bit of warmth, so I started painting all of the walls a neutral beige color. While the beige was an improvement over the white, after a few months I realized it was all so booorrring. Beige furniture + beige walls = blah. So this last year, I have been on a mission to give me house a bit of color. I started with the living room. Since my furniture wasn’t going anywhere, I decided to add color on and around it. Since we bought the house, my husband had given me free reign, and the only thing that was important to him was to incorporate family photos. 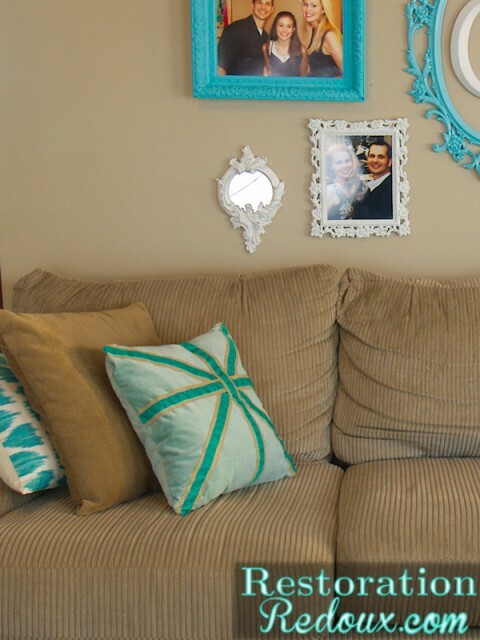 So I made my own gallery wall by painting vintage frames, and I added a pop of turquoise. Unfortunately, when I bought my couch, the pillows that came with it were … wait for it…. beige! They went with my turquoise from my frames. They looked great, but they still weren’t quite enough. 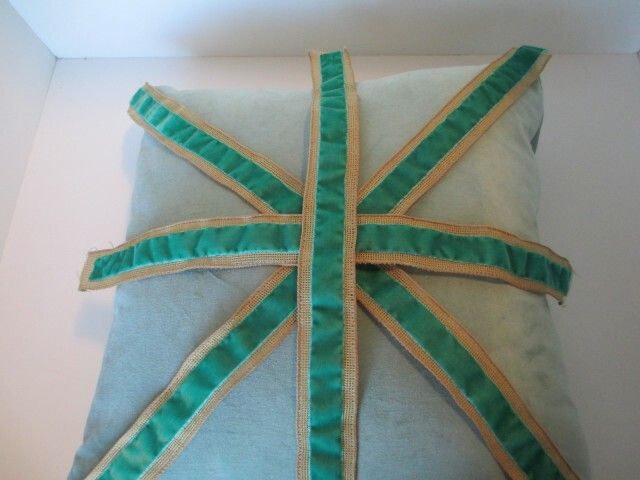 I had been looking for another set (possibly a Union Jack set) to coordinate with what I had, but seeing as how I’m pretty picky I decided to make my own. 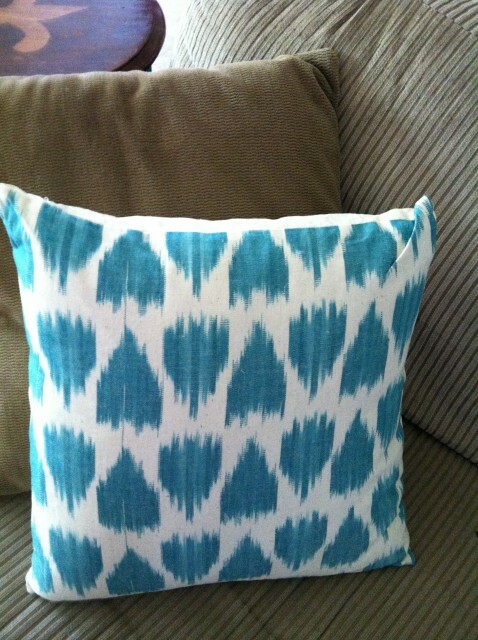 First I started with two inexpensive aqua pillows that I got at World Market. 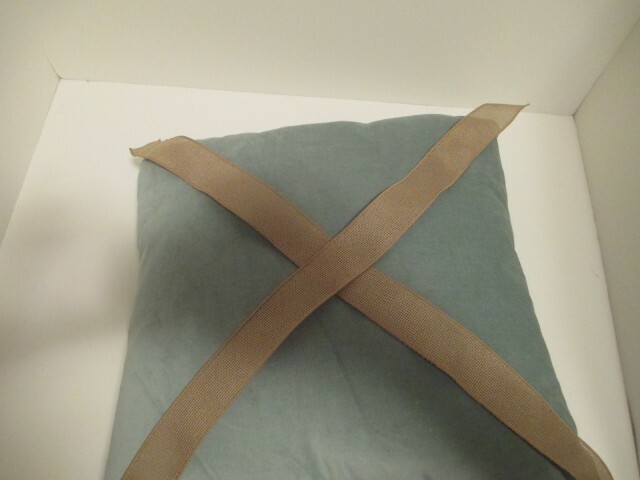 I then bought a tan, almost burlap-looking, ribbon and a thinner, turquoise velvet ribbon. 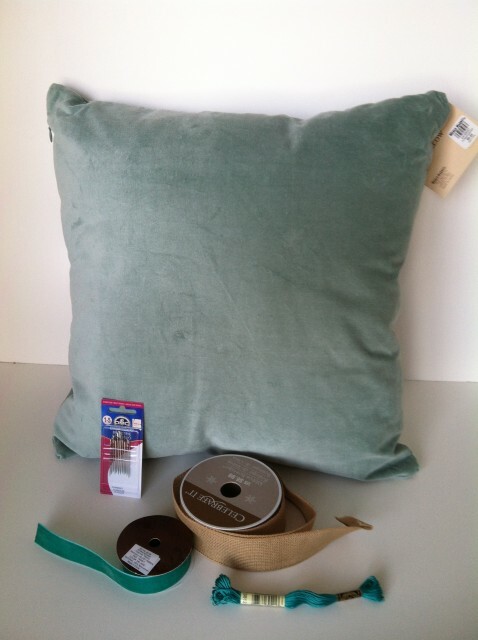 I also bought a package of needles (since I don’t sew) and a turquoise and a tan package of embroidery thread. First I measured out my tan ribbon, making sure it would stretch from one corner to the other one diagonally (I made two of these). I then measured two more ribbons, one going vertically and one going horizontally (like a plus sign). 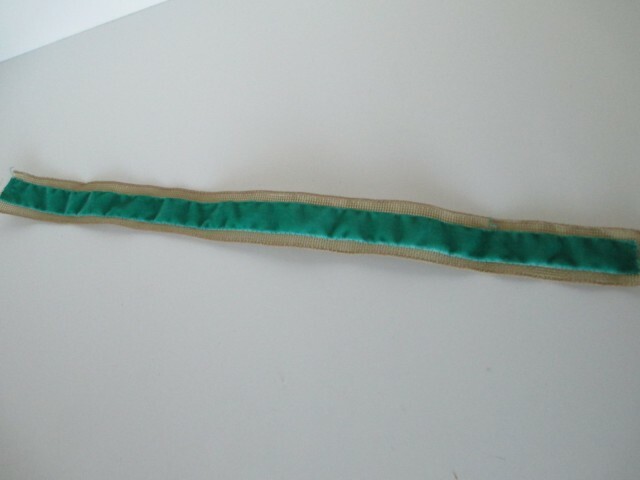 I then measured-out the turquoise ribbon exactly the same length as the tan ribbon. 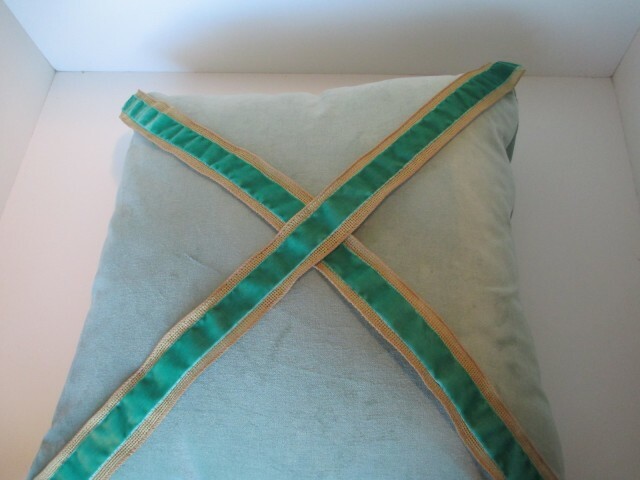 Then I sewed-on the turquoise ribbon to the tan ribbon (just a simple whip stitch). 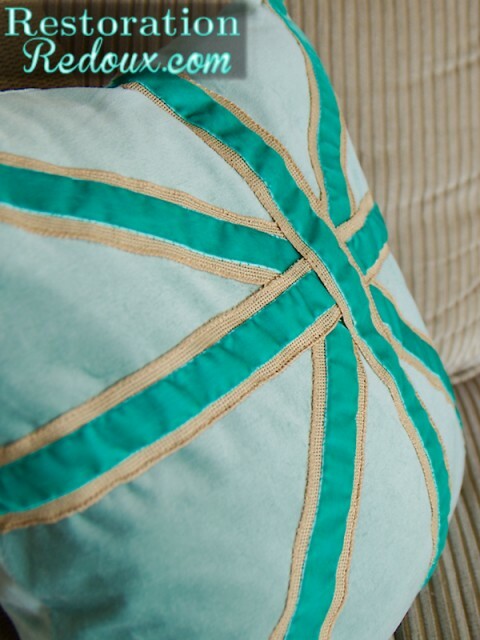 After all of the turquoise ribbons were sewn to the tan ribbon, then you start sewing the pieces directly to the pillow. This takes a bit of time but after that … you are finished! 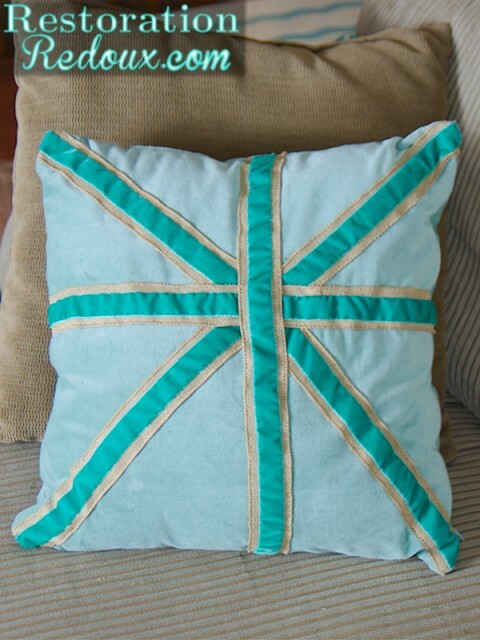 You could customize your Union Jack pillows with whatever colors you want! If you want to see any of my other furniture makeovers or crafts, I would love for you to visit me at Restoration Redoux! I will see you next month! I love the texture the burlap added! This looks like a sewing project I could actually handle!! Cute! 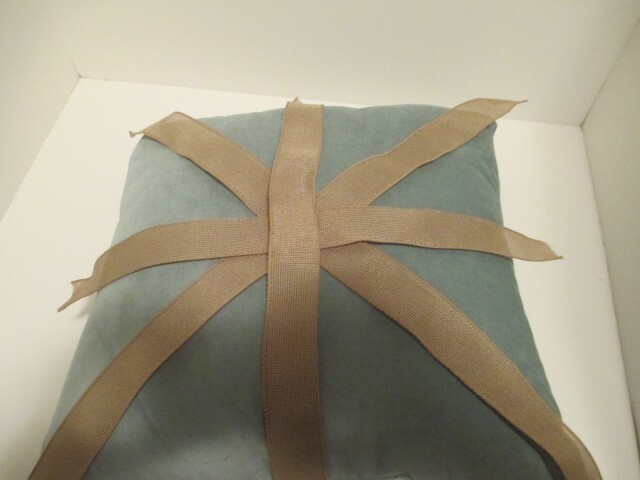 I really like how you started with a plain solid colored pillow and then just added the ribbon striping to it. It looks pretty easy to do. Great idea, love those colors!